As of Tuesday, Yellow Lot 12, the Orange Preferred Car, Brown Preferred and Family Friendly lots will be closed on Saturday. Several RV lots will be closed as well (see below for details). Fans who normally park in reserved lots that are paved or on grass will not be affected. Permit holders with a white stripe through their permit have a paved parking space, which are not impacted by Saturday’s closures. Penn State will continue to monitor the forecast and conditions for the rest of the week that could potentially result in additional lot closures. 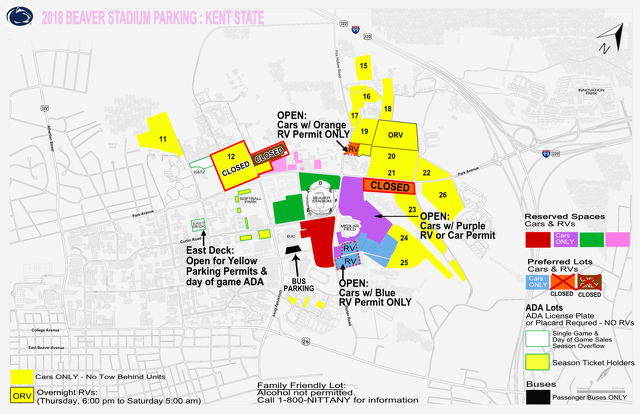 -- Yellow Lot 12 will be closed and fans will be re-directed to another general lot. Fans who normally park in this lot should approach campus from the east on Park Avenue, off I-99/U.S. Route 322, from the south on Porter Road, off Route 26/College Avenue or from the west via Atherton Street and Park Avenue (cars will be directed to Yellow Lot 11, East Parking Deck or Nittany Parking Deck). -- Brown and Orange Lots will be closed. Brown and Orange parking passes will be honored in all Yellow lots other than 12. Cars should approach from the east on Park Avenue, off I-99/U.S. Route 322, from the south on Porter Road, off Route 26/College Avenue or from the west via Atherton Street and Park Avenue (cars will be directed to Yellow Lot 11, East Parking Deck or Nittany Parking Deck). -- Family Friendly Lot will be closed. Patrons should park in a Yellow lot with their regularly issued parking permit location. -- Blue and Orange RV Lots will be closed to RVs. Those who normally park an RV in these lots will be able to park one car with their RV permit. -- Purple Lot RV permit holders are also asked to not bring an RV. -- Overnight RV Lot will open Thursday at 6 p.m. Parts of the RV Lot may not be parked due to ground conditions. -- Fans who have not already purchased an RV parking permit should not attempt to park in the lots near Beaver Stadium. Fans interested in parking their car or RV at Grange Park can reserve a spot by calling 814-364-9212. 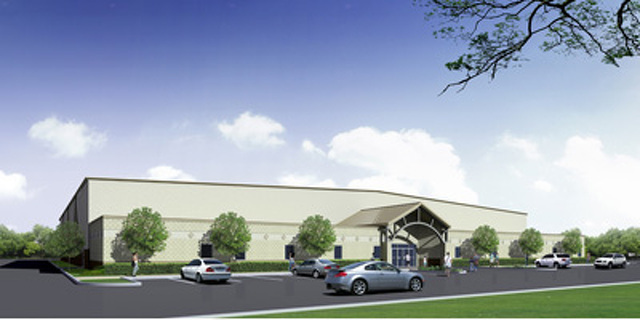 The long-planned Nittany Valley Sports Centre will receive $1.5 million in state funds to help complete construction, state Senate Majority Leader Jake Corman, R-Benner Township, announced on Tuesday.